The Kyiv Sikorsky International Airport in February 2019 serviced 185,200 passengers, which is 41.7% more than in February 2018. According to statistics released by the airport’s press service, the number of passengers serviced on international flights in February was 180,000, on domestic flights – 5,200. The number of flights in February was 2,007 for arrivals and departures, which is 21.8% more than the same period of 2018, including1,680 international flights, and 327domestic flights. 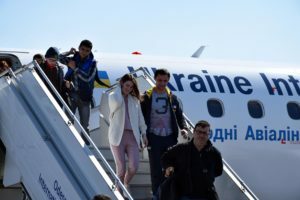 The most popular international destinations in February 2019 were Sharm el-Sheikh (Egypt), Warsaw (Poland), Minsk (Belarus), Ankara (Turkey), Vienna (Austria), Berlin (Germany), Budapest (Hungary), and domestic destinations were Odesa, Zaporizhia and Lviv. The Kyiv Sikorsky International Airport in January-October 2018 serviced 2.42 million passengers, which is 56.3% more than a year ago. “November 13, the Kyiv airport serviced the 2.5 millionth passenger since the beginning of 2018… The plans of the airport are to service 2.8 million passengers in 2018,” the airport said in a press release on Wednesday. Passenger flow increased 64.2%, to 1.85 million. 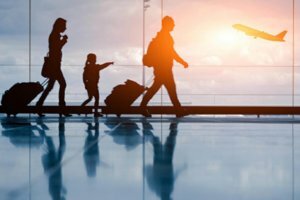 According to the report, in October this year, passenger traffic increased 48.6% from October of last year, to 259,100 passengers. The airport said that 2.35 million passengers were serviced on international flights in January-October of this year, and only 73,000 passengers on domestic flights, including 251,600 and 7,500 respectively in October. The number of flights increased 32.9% in January-October 2018, to 25,900, of which international ones made up 21,880. In October, the increase in the number of flights was 27%, to 2,720, including 2,270 international flights. According to the release, the most popular international destinations in January-October 2018 were Minsk (Belarus), Warsaw (Poland), Sharm el-Sheikh (Egypt), Dubai (the United Arab Emirates), Antalya (Turkey), Ankara (Turkey), Rome ( Italy); internal – Odesa, Zaporizhia, and Lviv. Kyiv Sikorsky International Airport (Zhuliany) in 2019 plans to boost passenger traffic by 25-30% compared with the current year, when it plans to serve 2.6 million people. 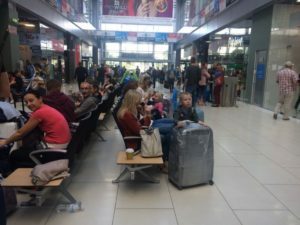 “We plan passenger traffic will grow by about 25-30% next year from the current level,” Chairman of the airport’s Board of Directors Denys Kostrzhevsky said at a conference at the airport. The previously announced forecast for 2018 set at 2.8 million passengers was reduced because flydubai (the UAE) had switched flights to another airport while the density of the schedule of Estonia’s Nordica had decreased. As reported, Kyiv Sikorsky International Airport plans to complete the reconstruction and expansion of its main Terminal A from 14,000 to 23,500 square meters by until May 2019. The project is estimated at UAH 630 million. Kyiv Sikorsky International Airport is located in the business center of the capital, seven km from the city center. 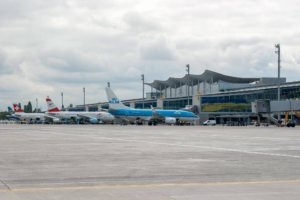 It is the second largest airport in Ukraine in terms of the number of flights and passenger traffic. The airport has three terminals with a total area being 21,000 square meters. The airport’s runway is able to handle B-737 and A-320 aircraft.